Step into a news editor's shoes and create a genuine looking article about yourself or one of your friends in just a few clicks. All you need to do is to provide story's hero details. It's quite simple. Pick a story and fill out the form providing hero's details. That's it! We'll create a link encoded with all the data you provided. This way there is no need to store your information anywhere on our servers and the story address is known only to you. We care about your privacy. Our website is basically a set of fictional news article templates in which you can replace some of their content, mainly personal details and location, with the data you provide. When creating an article, you in fact create just a link that contains all the information you passed onto a form. When you open that link our website grabs the data, decodes it and inserts into article template on-the-fly. The link is private and known only to you, we won't publish it anywhere, it's up to you what you'll do with it. Have a look at the articles we prepared for you. When you find something you like just tap it and use the form to create a new story with a hero of your choice1. Share your story on facebook, twitter or wherever you fancy. Completely drunk man confused a police car with a taxi. 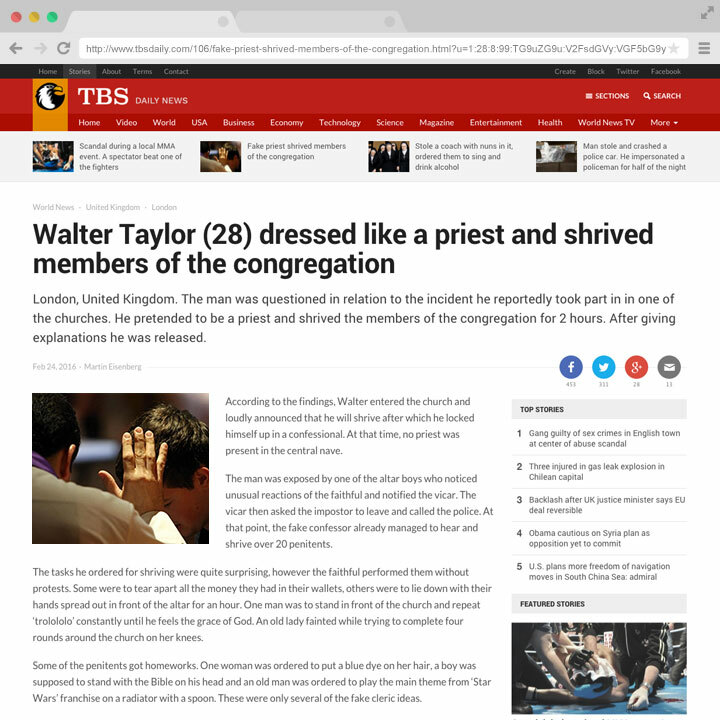 Fake priest shrived members of the congregation. Scandal during a local MMA event. A spectator beat one of the fighters. Started a fight with a group of policemen and run away. Search is in progress. Man stole and crashed a police car. He impersonated a policeman for half of the night. Reported poisoned beer, was too embarrassed he doesn’t hold his liquor well. Starred in an adult film. Now wants it taken off the shelves. Caught driving naked with stolen chickens and a swan. Stole a coach with nuns in it, ordered them to sing and drink alcohol. Highest blood alcohol level recorded. Woman tripled the level considered lethal. Came back to life in the morgue... and returned to the party. Man notified the police that his cocaine was stolen. Ends up being prosecuted. This website allows you to insert personal details into news article templates and therefore create fictitious stories about people of your choice. Although we inform viewers that what they just read is not true the stories may seem legit at first sight, so please keep that in mind when sharing links. You take the full responsibility for your actions. We do not allow to create stories about other people without their clear consent. Although those are usually funny stories that can be erased at any time some people may not like it and may take legal actions against you for using their details. You should also always inform all your reciepients about the nature of this site. Unless otherwise stated, News Generator and/or it’s licensors own the intellectual property rights for all material on this site. All intellectual property rights are reserved. You may view and/or print pages for your own personal use subject to restrictions set in these terms and conditions. You must not republish, sell, rent, sub-license, reproduce, duplicate, copy material from this site or redistribute content from News Generator (unless content is specifically made for redistribution). We control and operate this Site from our offices in Poland, EU. We do not represent that materials on this Site are appropriate or available for use in other locations. Persons who choose to access this Site from other locations do so on their own initiative, and are responsible for compliance with local laws, if and to the extent local laws are applicable. For the purpose of creating stories we need to process some personal information like first name, last name, gender, age, location and IP address. Except for IP this information is encoded into a story address, stored and used from there. Like many other Web sites, we make use of log files. The information inside the log files includes IP addresses, type of browser, ISP, date/time stamp, referring/exit pages, and number of clicks to analyze trends, administer the site, track user’s movement around the site, and gather demographic information. © 2019 News Generator. All rights reserved. We force your browser to eat cookies.